Patient care refers to the management of both critical and chronic conditions within the hospital, emergency, home or specialist environments. Advances in science and technology are impacting conventional methods and practices. 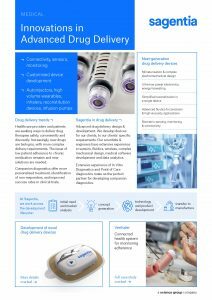 Sagentia helps develop transformational medical technology to help shape a new age of patient care. We work with companies to develop products that treat acute and chronic conditions. Most of our work revolves around the application of science and technology expertise to help address fundamental health issues. Our core capability lies in the development of complex physical devices that are both clinically and cost effective, from concept design through to prototype and transfer to manufacture. Click here to view our sales sheet in full. To arrange an informal chat with one of our medical team please complete our contact form.